Karnataka Result: Poll trends suggested the BJP was leading in over 100 constituencies in Karnataka. 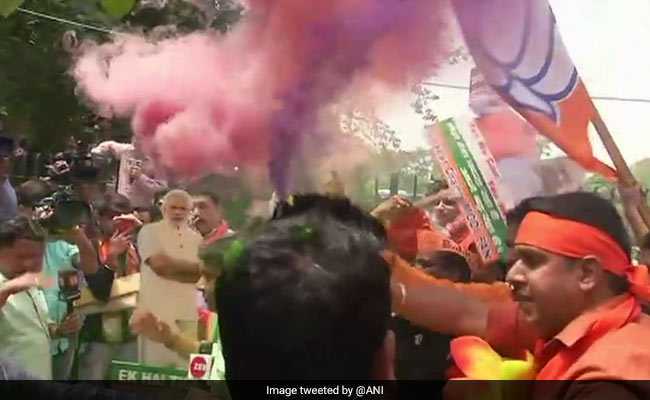 Election Result: BJP workers celebrate lead in Karnataka. Chennai: Arch-rivals ruling AIADMK and DMK in Tamil Nadu today greeted the BJP for its performance in the Karnataka Assembly elections where the saffron party appeared headed for a simple majority. The two major Dravidian parties' greetings came as the BJP won seven seats and is leading in 102 constituencies as per the latest trends and results for 221 of the 222 constituencies, where the polling was held on May 12. "Chief Minister K Palaniswami greeted Prime Minister Narendra Modi for BJP's win in the Karnataka Assembly elections," an official release said. He sent a letter to PM Modi in this regard, it added. Congress candidates have won two seats and were ahead in 69, while the JD(S) was leading the table in 39 constituencies. DMK Working President M K Stalin greeted the BJP and its Chief Ministerial candidate B S Yeddyurappa on behalf of his party and expressed hope that the new government would ensure cordial ties with Tamil Nadu. In a Facebook post and a tweet, the Leader of the Opposition in the state assembly also urged the new dispensation to release soon Tamil Nadu's share of water from the Cauvery river. "I believe the BJP, which is going to take charge, will not violate Tamil Nadu's rights on Cauvery as per the Supreme Court order and strive for cordial ties with the neighbouring state," he said. Tamil Nadu and Karnataka are locked in a decades-old dispute over sharing Cauvery waters. Karnataka had on May 3 said it was not in a position to release Cauvery water to Tamil Nadu even as the Supreme Court sought to know the quantum of water that can be spared. The centre had yesterday filed a draft Cauvery management scheme before the Supreme Court, in line with its directive. The top court on February 16 asked the centre to formulate the scheme to ensure compliance of its judgement on the Cauvery dispute. The court had modified the Cauvery Water Disputes Tribunal (CWDT) award of 2007 by raising the 270 tmcft share of Karnataka by 14.75 tmcft and reduced Tamil Nadu's quantum while compensating it by allowing extraction of 10 tmcft groundwater from the river basin.